Despite only losing 1lb last week I am really starting to enjoy the 5:2 diet and almost find myself looking forward to fast days. Weird eh? Today’s recipe has been a huge hit with both me and Mr B and last night we actually found ourselves getting quite full before we had even finished. I found this one on a really useful 5:2 app that I have been using which you can find here. In a large dish heat oil and fry chicken, garlic and green chilli for five minutes or until chicken starts to brown and onions soften. Add cardamom, cumin, chilli flakes, ginger and turmeric and fry for a further minute coating all of the chicken and onions. Add the spinach leaves and cover the dish, cooking gently until the spinach wilts. Then add the tomatoes and simmer for 15 minutes until the chicken is cooked throughout, removing the lid for the last 5 minutes. Season with salt and pepper to taste. Stir in the yoghurt and coriander to serve. 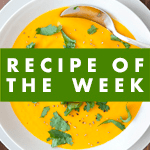 This recipe makes 4 servings and each serving contains just 205 calories! I served ours with a 30g (dry weight) portion of boiled basmati rice each bringing total calories to 312 per person. If you want to freeze the remaining portions I would recommend removing the required amount before stirring in the yoghurt and adding this when required. You can find a while load of great 5:2 recipes on this wonderful pinterest board here. I love coming over and looking at your fabulous meal ideas, unfortunately curry isn’t my cup of tea but I’m sure Mr Boo would love me to make this for him. Do you think it would work with quorn fillets? 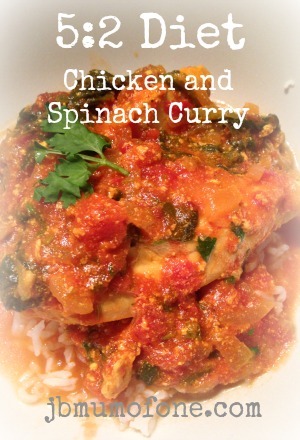 We love Indian, especially if it involved spinach, looks so appetizing! It really does. This is definitely one of my favourite 5:2 meals and great in winter! Are your calorie counts correct? One small chicken breast cooked without skin or bone is at least 200 calories, plus you have added oil and yogurt. Tomatoes and onion add a small amount of calories also. Well, this is what is quoted on the 5:2 app but I have just run it through the myfitnesspal app to compare and come up as 226cals without the rice. Guess it might depend on the size of your chicken breasts. It is good isn’t it, and pretty filling too! Good luck.